The fourth, last, and only spontaneous stop of this particular progressive series was Juice Box, a favorite of the four of us. Though, Thomas’s stomach couldn’t handle anymore food so he left it to us girls to indulge. Juice Box is a pretty popular Taiwanese dessert/fruit bar. It’s usually bumping and the demographic is pretty young. teenagers to young professionals. My dad commented that he usually sees “young people” spill out the door waiting in line when he’s in China town, Houston. 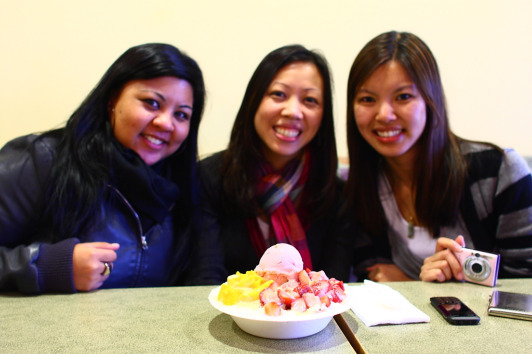 We wanted their famed shaved ice desserts and let Jessica take the reins in ordering. She chose strawberry ice cream with strawberries and mangoes. 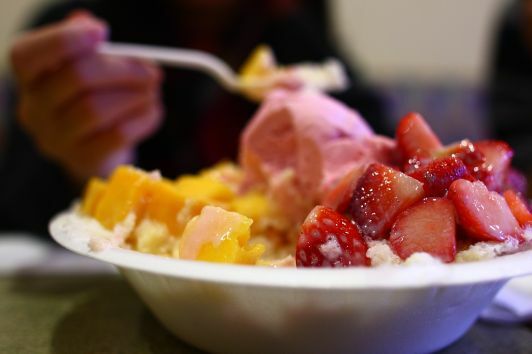 So our dessert is a bowl of shaved ice, with a copious scoop of strawberry ice cream, fresh strawberries and mangoes on top and then all of that is doused with CONDENSED milk. Mmm. This dessert satisfies in numerous ways. The sweet ice cream, the freshness of the fruit (the mangoes were the right amount of ripe), the quenching shaved ice, and as if all that isn’t enough? Smooth, sweet, thick, wonderful condensed milk is poured over it. We finally tapped out. Actually I believe we started at 1:00 pm and that was around 4:30 pm when we were done. Us girls had dinner plans with Cindy at 7:00pm so we had a 2 hour break before stuffing our face AGAIN for dinner….I’ll save that for another blog post. P.S. 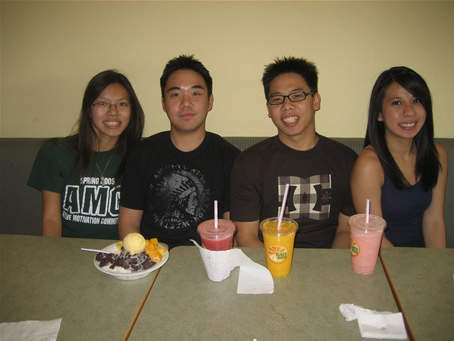 Here is a photo of me in 2007 during my first trip to Juice Box. Ah we go way back. Thomas is in the picture too! Thomas and I have shared a lot of new restaurant finds through the years.